My first reaction was “HUH?” when I spotted this recipe. I adore ahi tuna as a happy hour appetizer with a nice blob of wasabi on the side, and the pungent puttanesca sauce ingredients are a nice change from plain old pasta and pesto. But combined together?? Seemed a little strange. 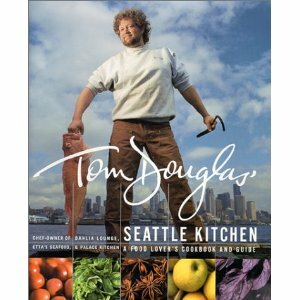 But then again…this recipe is from a Tom Douglas cookbook. So I knew it would turn out great. Put a pot of salted water on to boil for cooking the pasta. Put a large saute pan over high heat. Add the olive oil, garlic, pepper flakes, oregano and cook, stirring for 1 minute. 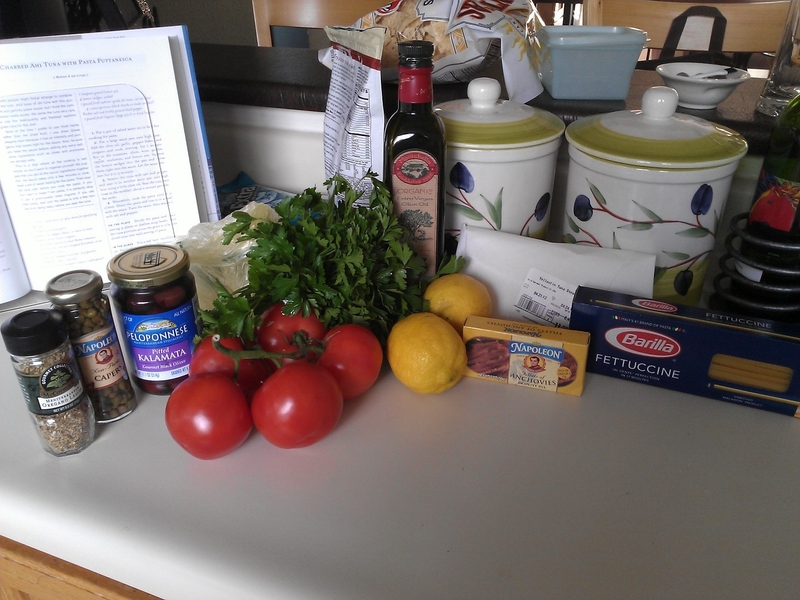 Stir in the tomatoes, olives, wine, parsley, capers anchovies and lemon zest. Squeeze the lemon wedges into the pan and throw them right into the sauce. Let the sauce simmer for 2 – 3 minutes. Season the tuna with salt and pepper and sear it in another saute pan over high heat using a little olive oil. Sear the tuna rare (raw in the middle), about a minute per side. Set aside. Meanwhile, cook the pasta until it is al dente. Drain the pasta and toss it in a bowl with the sauce. Taste the sauce, and then season it with salt and pepper. Divide the pasta and sauce among 4 plates or shallow soup bowls. Slice the tuna portions across the grain and fan the sliced tuna over each serving of pasta. My notes: timing is everything with this dish because the ingredients come together very quickly. I recommend starting the pot of water to boil for the pasta before doing the prep work with chopping and dicing the tomatoes and olives (if you are using dried pasta like I did which takes a little longer to cook). Try putting the pasta on to cook and then start cooking the sauce and searing the steaks. Some may prefer fresh oregano to dried, but the dried oregano has the right intensity for this sauce. Taste the sauce before adding any additional salt and pepper, as the olives and anchovies are already salty. Do a “smell test” of your dried oregano beforehand. If it’s not super pungent, throw it out and get a fresh jar. Be sure to choose sashimi-grade ahi tuna because it will be rare in the middle after you sear it (by design). And be prepared for some sticker shock – it was $23.00 / lb when I swung by the seafood counter at my favorite grocery store. So I went with just a half a pound…and it’s worth every penny. I prefer adding the chopped parsley just before serving, rather than during the cooking process. This keeps the parsley’s flavor fresh and it’s a nice color contrast with the pasta, sauce and the tuna steaks. I too was a little squeamish and “ewww” about the anchovies. It’s not something I typically shop for. But anchovies are essential for the true, pungent flavor you want in this sauce. When they are diced up and done sautéing you won’t even notice they are there. But your fingers might smell a little after chopping them up. Rub some lemon wedges over them to fix that. Do you know what “puttanesca” means? Well, pasta puttanesca literally means “whore’s spaghetti.” There are many stories to its origins, but the version I recall most vividly is from an Italian cooking instructor I had the pleasure of learning from many years ago. “…the sauce is HOT, CHEAP and QUICK” she exclaimed. Ah, got it.